"Comprehensively covers the design, construction, and operation of gas chromatography, liquid chromatography, and thin-layer chromatography detectors--all in one convenient, up-to-date source. Emphasizes the essential use of common specifications to describe all detectors, allowing easy comparison of their attributes." ". . .the almost unique style. . .is refreshing. . .an excellent account of the principles and practice of detectors without all the math and a myriad of equations. " ". . .highly recommended. " 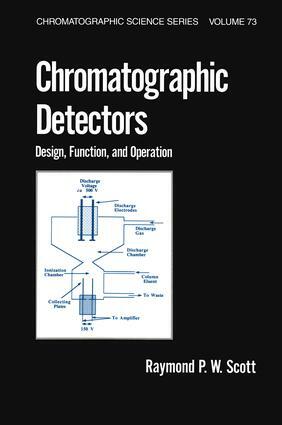 Detector properties and specifications: introduction to chromatography detectors; detector specifications; data acquisition and processing, Gas chromatography detectors: gas chromatography detectors, their evolution, and general properties; the flame ionization detector and its extensions; the Argon ionization family of detectors; the katherometer and some of the less well known detectors. Liquid chromatography detectors: introduction to LC detectors- the UV detectors; the fluorescence and other light processing detectors; the electrical conductivity detector and the electrochemical detector; the refractive index and associated detectors; multifunctional detectors and transport detectors; chiral detectors; the radioactivity detector and some lesser known detectors; detection in thin layer chromatography. General detector techniques: gas chromatography tandem systems; practical detector techniques; quantitative analysis.